Today we begin a monthlong series about popular Minnesota landmarks, their architectural histories, little-known details, and their present situations. Each anecdote will be published on Mondays throughout the next few weeks. This series is written by Alan K. Lathrop, curator of the Manuscripts Division at the University of Minnesota Libraries from 1970 to 2008. You can find more details about the buildings and architects discussed in brief here in Lathrop's book Minnesota Architects. At one time, the tallest office building between Chicago and the West Coast stood in downtown Minneapolis. 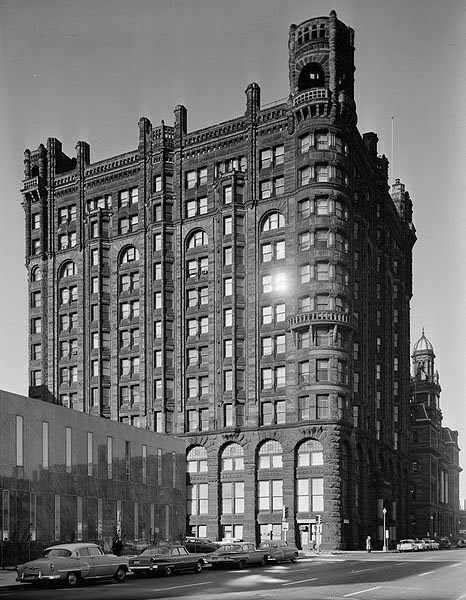 It was the Guaranty Loan Building, erected at the corner of 2nd Avenue South and 3rd Street South in 1889-90 by the local entrepreneur, Louis Menage. More commonly known as the Metropolitan Building (renamed after Menage's financial shenanigans forced the bankruptcy of his firm and sale of the building to Metropolitan Life Insurance Company), the magnificent structure was designed by Edward Townsend Mix of Milwaukee. 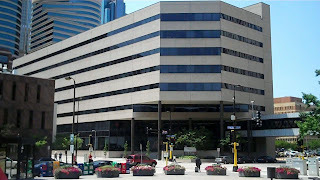 Mix had previously designed the grand William Washburn residence (1883) near the present location of the Minneapolis Institute of Art, as well as Temple Court (1886) and the Globe Printing Company buildings in Minneapolis and St. Paul (1888 and 1887 respectively). All of Mix's office buildings featured a central light court, but that of the Metropolitan Building was the most spectacular. Daylight was brought in through a skylight over an atrium which extended virtually the entire 10-story height of the building. To further enhance the effect, the floors ringing the atrium were made of thick translucent glass to both convey and diffuse light into otherwise dimly lit hallways. Today, not one of Mix's Twin Cities structures survives (although his Dodge County Courthouse in Mantorville , the oldest of his Minnesota Commissions, is still standing). The Metropolitan Building was, sadly, demolished in 1962, the victim of the urban renewal zeal that gripped the Twin Cities and many other areas. Ever since its demise, historic preservationists, architectural historians, and members of the general public have mourned its loss. Its replacement, the Galaxy Building (and now the Towle Building), is a far cry from the charm and stateliness of the Metropolitan, which is considered by some to be the city's first skyscraper. Alan K. Lathrop is author of Minnesota Architects (2010) and Churches of Minnesota (2003). Read more of his blog posts here.